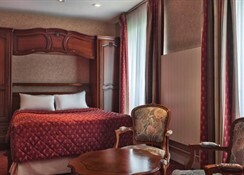 The air-conditioned, 72-room city hotel is perfect for both business and leisure. There is a private, independent parking area just in front of the hotel and laundry services are available from Monday to Friday. There is a free safety deposit box at the front desk and room service is offered for guests' convenience. The hotel also offers a lobby with a 24-hour reception and check-out service, a cloakroom, lift access, a bar, breakfast room, conference facilities and Internet access. Pet accommodation is available at an extra charge per night. Extra bedding is free in rooms shared by up to one child, aged 12 or under and 2 parents/grandparents. 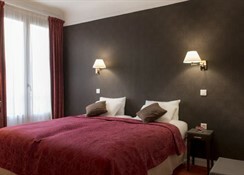 This business hotel is ideally located on the left bank in one of the liveliest areas of Paris. 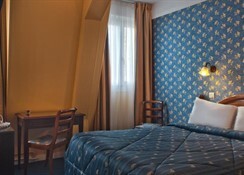 The hotel is close to famous landmarks like the Eiffel Tower, the Louvre, Musee d 'Orsay, the Arc de Triomphe and Notre Dame. A visit to one of the most beautiful avenues in the world, the Champs-Elysees, with its many cinemas, cafes and specialty shops, is a real must. The establishment is close to a metro station and within walking distance of theatres, markets, and many great restaurants and bars. 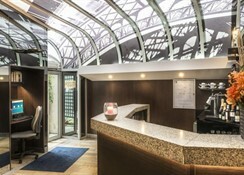 Charles de Gaulle Airport is approximately 29 km from the conference hotel and Orly Airport is around 15 km away. 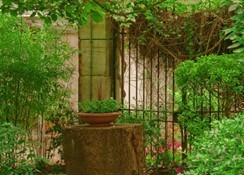 All rooms on the street side or garden side are equipped with the utmost comfort in mind. Due to the ever-changing Parisian climate, the hotel has installed individually controlled air conditioning and double glazing, which will ensure a perfect in-room atmosphere. A telephone is provided so guests can stay in direct communication with their friends or work contacts, and Internet access can be accessed via a laptop. 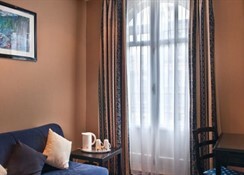 For guests' convenience, each room has a minibar and TV with Canal+ and satellite movies. Each room additionally features an en suite bathroom with shower, bathtub and hairdryer, a double bed, radio and central heating. Guests can request a non-smoking room when booking.